This article is about the Roman Catholic translation. For the Jewish translation, see Koren Jerusalem Bible. Old Testament: La Bible de Jerusalem, Masoretic text with strong Septuagint (especially in Psalms) and some Vulgate influence. New Testament: La Bible de Jérusalem, Eclectic text with high correspondence to the Nestle-Aland Novum Testamentum Graece with major variant readings from the Majority text and sacred tradition (i.e. Comma Johanneum and the longer ending of Mark) incorporated or noted. Deuterocanon: Septuagint with Vulgate influence. dynamic equivalence with a highly polished style. 1966, 1967 and 1968 by Darton, Longman & Todd Ltd and Doubleday and Co. Inc. In the beginning God created the heavens and the earth. Now the earth was a formless void, there was darkness over the deep, and God's spirit hovered over the water. God said, 'Let there be light', and there was light. 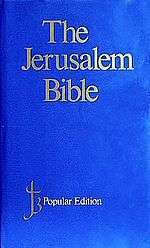 The Jerusalem Bible (JB or TJB) is an English-language translation of the Bible that was first introduced to the English-speaking public in 1966 and published by Darton, Longman & Todd. As a Catholic Bible, it includes the traditional 73 books found in most English translations until the mid 19th century: the 39 books shared with the Hebrew Bible, along with the seven deuterocanonical books as the Old Testament, and the 27 books shared by all Christians as the New Testament. It also contains copious footnotes and introductions. In 1943 Pope Pius XII issued an encyclical letter, Divino afflante Spiritu, which encouraged Roman Catholics to translate the Scriptures from the Hebrew and Greek texts, rather than from Jerome's Latin Vulgate. As a result, a number of Dominicans and other scholars at the École Biblique in Jerusalem translated the scriptures into French. The product of these efforts was published as La Bible de Jérusalem in 1956. This French translation served as the impetus for an English translation in 1966, the Jerusalem Bible. For the majority of the books, the English translation was a translation of the Hebrew and Greek texts; in passages with more than one interpretation, the interpretation chosen by the French translators is generally followed. For a small number of Old Testament books, the first draft of the English translation was made directly from the French, and then the General Editor produced a revised draft by comparing this word-for-word to the Hebrew or Aramaic texts. The footnotes and book introductions are almost literal translations from the French. The translation itself has been admired for its literary qualities, perhaps in part due to its most famous contributor, J. R. R. Tolkien (his primary contribution was the translation of Jonah). It is commonly held that the Jerusalem Bible was not a translation from the French; rather, it was an original translation heavily influenced by the French. This view is not shared by Henry Wansbrough, editor of the New Jerusalem Bible, who writes, "Despite claims to the contrary, it is clear that the Jerusalem Bible was translated from the French, possibly with occasional glances at the Hebrew or Greek, rather than vice versa." The dynamic equivalence of the translation is more "thought-for-thought" than "word-for-word" compared to other modern translations. The introductions, footnotes, and even the translation itself reflect a modern scholarly approach and the conclusions of scholars who use historical-critical method. As examples, the introduction and notes reject Moses' authorship of the Pentateuch, as well as the Book of Wisdom having been authored by King Solomon. The Jerusalem Bible was the first widely accepted Roman Catholic English translation of the Bible since the Douay-Rheims Version of the 17th century. It has also been widely praised for an overall very high level of scholarship, and is widely admired and sometimes used by liberal and moderate Protestants. The Jerusalem Bible is one of the versions authorized to be used in services of the Episcopal Church and the Anglican Communion. The Jerusalem Bible returned to the use of the historical name Yahweh as the name of God in the Old Testament, rendered as such in 6,823 places within this translation. The move has been welcomed by some; however, it has not been popular among groups who would prefer the name of God be left unpronounced, or substituted with Lord or another title. On 29 June 2008, Cardinal Francis Arinze, Prefect of the Congregation for Divine Worship and the Discipline of the Sacraments, wrote to the presidents of all conferences of bishops at the behest of Pope Benedict XVI, stating that the use of the name Yahweh was to be dropped from Catholic Bibles in liturgical use, (most notably the CTS New Catholic Bible, which uses the Jerusalem Bible text) as well as from songs and prayers, since pronunciation of this name violates long-standing Jewish and Christian tradition. In 1973, the French translation received an update. A third French edition was produced in 1998. In 1985, the English translation was completely updated. This new translation — known as the New Jerusalem Bible — was freshly translated from the original languages and not tied to any French translation (except indirectly, as it maintained many of the stylistic and interpretive choices of the French Jerusalem Bible). In 2007 the Catholic Truth Society published the CTS New Catholic Bible, consisting of the original 1966 Jerusalem Bible text revised to match its use in lectionaries throughout most English-speaking countries, in conformity with the directives of the Congregation for Divine Worship and the Discipline of the Sacraments and the Pontifical Biblical Commission. The name "Yahweh" has been replaced by "the LORD" throughout the Old Testament, and the Psalms have been completely replaced by the 1963 Grail Psalter. The revised text is accompanied by new introductions, and textual and liturgical notes, supplemented as needed with material from the notes to the New Jerusalem Bible. Last updated in 1998, the French La Bible de Jérusalem is currently the subject of a revision project operating under the title The Bible in its Traditions. According to the notes, more weight will be given to the Septuagint in the translation of the Hebrew Bible Scriptures, though the Masoretic Text will remain the primary source. The French portion of the Demonstration Volume is available online, together with a single sample of the English translation. In this new version, the tetragrammaton is not transliterated as in the Jerusalem Bible and the New Jerusalem Bible, and several kinds of commentary are included in a manner different from the practice of other Bible editions. ↑ "Liturgical Books In The English Speaking World". United States Conference of Catholic Bishops. Retrieved 26 October 2011. ↑ This is explained in the Editor's Foreword to the Jerusalem Bible. ↑ The Letters of J. R. R. Tolkien, letter 294, includes the following text: "Naming me among the 'principal collaborators' was an undeserved courtesy on the part of the editor of the Jerusalem Bible. I was consulted on one or two points of style, and criticized some contributions of others. I was originally assigned a large amount of text to translate, but after doing some necessary preliminary work I was obliged to resign owing to pressure of other work, and only completed 'Jonah', one of the shortest books." ↑ Wansbrough, Henry. "How the Bible Came to Us". ↑ Gleason Archer, "The Old Testament of The Jerusalem Bible." Westminster Theological Journal 33 (May 1971), pp. 191–94. ↑ CatholicMusicNetwork.com (26 August 2008). "Vatican Says No 'Yahweh' In Songs, Prayers At Catholic Masses". Catholic Online. Catholic.org. Retrieved 13 January 2015. ↑ Arinze, Francis; Ranjith, Malcolm. "Letter to the Bishops Conferences on The Name of God". Bible Research: Internet Resources for Students of Scripture. Retrieved 13 January 2015. ↑ Gilligan, Michael. "Use of Yahweh in Church Songs". American Catholic Press. Retrieved 13 January 2015. ↑ Roxanne King (15 October 2008). "No 'Yahweh' in liturgies is no problem for the archdiocese, officials say" (PDF). Denver Catholic Register. Archdiocese of Denver. Retrieved 25 November 2014. ↑ Wansbrough, Henry, "Foreword," The CTS New Catholic Bible. ↑ "École biblique et archéologique française de Jérusalem". EBAF. ↑ "La Bible en ses Traditions". bibest.org.